Well, I'm starting the kitchen and feeling really good! It started with the pantry. 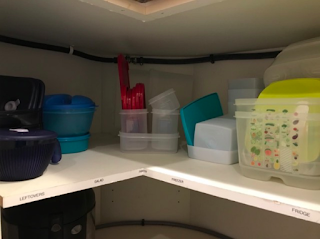 A few good friends have gotten me hooked on the look of Tupperware Modular Mates in the pantry, so I invested. But never really had time to go through and do it all. Until today. This was getting done! And I used my brand new (bought yesterday) label maker to help. I labeled the items, and added expiry dates for those I knew! How smart! 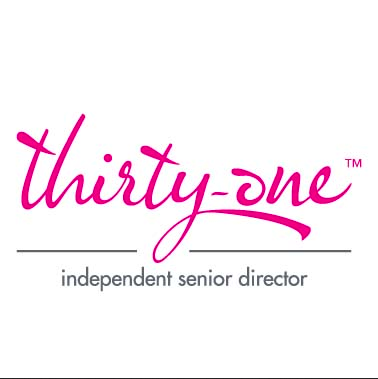 My few Thirty-One Gifts Your Way Rectangles hold items that are prepackaged. I have one for my Epicure spices, one for dinner sides and one for snacks. Now I need a few more (and they're on SALE in January) for the bottom shelf that has pasta and cans like veggies and soup. But so far, I love it! Then, it was onto the two corner cupboards. One has always been sort of a mish mash of stuff, and the other, mostly bowls, baking dishes, and some other random items. Oh, and I should mention that we don't use our dishwasher. When we moved, the realtor said it was better to hand wash and put away instead of having dishes in the dishwasher when showing. So we got used to hand washing, and never stopped when we moved in here. 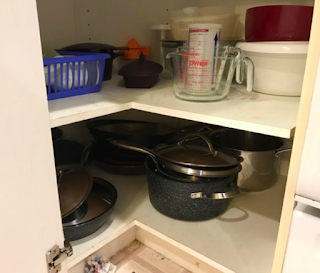 We briefly started using the dishwasher again, but the it broke, so we stopped, and used it for storing pots and pans. But, if I want to renovate the kitchen at some point, and maybe replace the dishwasher, then we need to find a better place for the pots and pans than in the dishwasher. So I decided that the corner cupboard next to the stove is where the pots and pans should be, on the bottom shelf because they're heavy. And the top shelf will be for food preparation items. 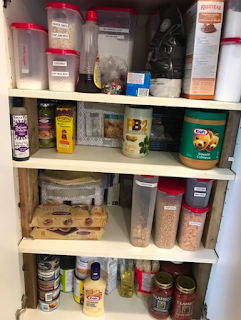 The other corner shelf will be for food storage items, because there's a bigger counter on that side and would probably be where we would pack up food, and do meal prep stuff after grocery shopping. So, here's what I have so far. All of my food storage is Tupperware, of course. And yes, I had to label it so my family would know which containers are for what. And yes, most of my food prep and cooking stuff is pampered chef or epicure. Being in Direct Sales, I have to support my Direct Sales peeps! Plus the stuff is amazing! And of course the part not normally shown during an organization challenge, the mess. Yes, it's time to say goodbye to the deep fryer. And the three extra glass baking dishes, and the 6 extra class bowls, and all the other random stuff that has no match or lid or hasn't been used in a few years, if it's been used at all. So, now comes the part of cleaning up the mess, and getting rid of the stuff we're not keeping. I should have kept all those huge Thirty-One boxes from the crazy holiday season. Time to get the business up again and collect more boxes so I can package this stuff up and take it to the thrift store! Then, onto the cupboards with the dishes, glasses/mugs, and (eeek) spices. Then drawers, then I'm DONE the kitchen!